OXFORD, Miss. 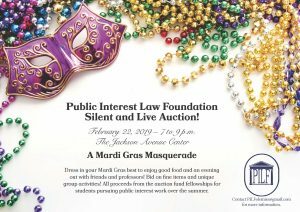 – The Public Interest Law Foundation at the University of Mississippi School of Law is bringing Mardi Gras to Oxford in February for the 2019 PILF Silent and Live Auction. The Mardi Gras Masquerade black-tie event will be held Feb. 22 from 7 p.m. to 9 p.m. at the Jackson Ave. Center. Guests will enjoy food and fun while bidding on items and activities to support PILF. The goal of PILF, a student-led organization, is to educate law students about the many areas of public interest law through volunteer opportunities and community involvement. Each summer, PILF also provides stipends to UM law students working in unpaid public interest jobs, making it possible for them to dedicate their time and service to others. All proceeds from the auction, which is PILF’s largest fundraiser of the year, will go toward funding students in their public interest work. Tickets are available to everyone. Warner received a PILF stipend after her first year of law school, which allowed her to work in Atlanta with Lambda Legal, a nonprofit organization dedicated to working on behalf of LGBTQ people. “This experience gave me incredible exposure to federal civil rights litigation at both the trial and appellate level in all types of law, from family law to employment discrimination to Title IX issues,” she said. Her work there helped her secure a position the following summer with Yale Law School’s Veterans Legal Services Clinic, where she assisted veterans with benefit appeals and class action litigation. These experiences shaped her career choice and helped her recognize the importance of public interest work. PILF’s mission is “law for people, not for profit,” and Warner said there are many areas encompassed by public interest law that can affect everyone’s life. Grace Sullivan, a second-year law student from Madison, comes from a background of social work and continues to follow that passion at UM Law. PILF assisted Sullivan and fellow law student Jasmine Bogard with a stipend to cover their travel to the Equal Justice Works Conference & Career Fair in Washington, D.C. in October. Through that opportunity, Sullivan and Bogard were able to network with other public interest organizations from across the country. “It gave me the chance to meet other students with similar passions and attorneys who were already working in areas of public interest, which broadened my understanding of how lawyers can further social and economic justice with their careers,” Sullivan said. Public interest work is noble and meaningful, but it is only possible through support. According to Sullivan, not only are those jobs hard to find, but they are often underpaid because there is simply not enough funding for free and low-cost legal services. All current and former students and guests are invited. Tickets are $30 per person and can be purchased through the UM foundation at umfoundation.com/pilf. For those who cannot attend, PILF’s mission can still be supported through a donation made at umfoundation.com/pilf, or by offering to mentor a student interested in public interest work.